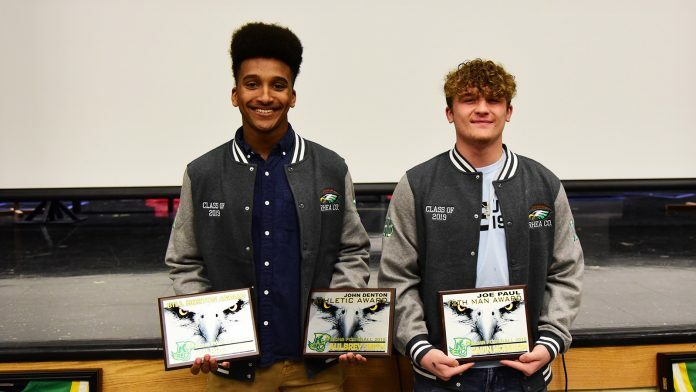 Football Seniors Receive Awards for Academics, Performance: Dugger & Kaylor Receive Scholarship Awards. 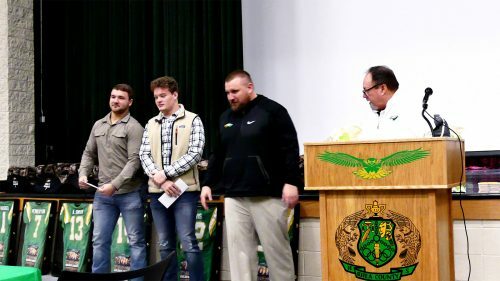 Evensville, TN — At the annual Rhea County Football banquet, two players took home three football individual plagues given out each year for football team. The Johnny Denton Academic Excellence award which goes to the player with the highest academic grade point average and ACT combined score went to Aubrey Smith. Next Gavin Morrison received the Joe Paul 12th man award. Morrison came back from severe injury to get back in lineup and did great job to win the award. Finally it was Aubrey Smith, who picked up the Bill Horton Award(voted on by players), for player who contributed the most to the program. Also receiving awards were Payton Dugger($500 Jake York Scholarship Award) and Chandler Kaylor($500 Touchdown Club Scholarship).